Present state: Demolished - an access road to a sewage works has obliterated the station site..
Notes: Ditchford was an early closure, losing its passenger service on 1st November 1924. After closure to passengers the station remained open for freight until 15th May 1950 and was also used by railwaymen and their families until at least June 1952, possibly later..
Northampton and the Midlands. The line was generally acknowledged to be a secondary mainline and regularly saw heavy through traffic but operating costs were high with a large number of manned level crossings. 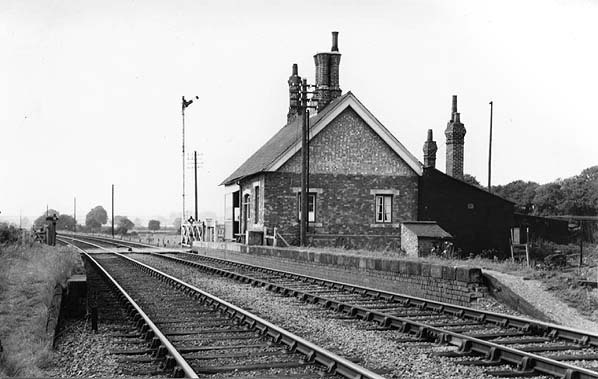 Ditchford Station in September 1952 shortly after unadvertised passenger use by railwaymen ceased. The site of Ditchford Station looking east in July 2005. 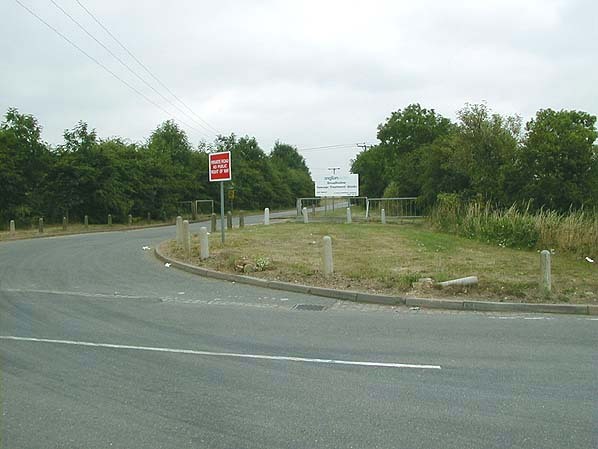 The level crossing was in the centre of the picture, the white sign and railings being on the site of the station.